I have shown my narrative paintings throughout the UK since 1990. My work, inspired the characters and the places I have lived and worked, has won several national awards including most recently the inaugural W Gordon Smith painting prize at the Dovecot Galleries in Edinburgh. 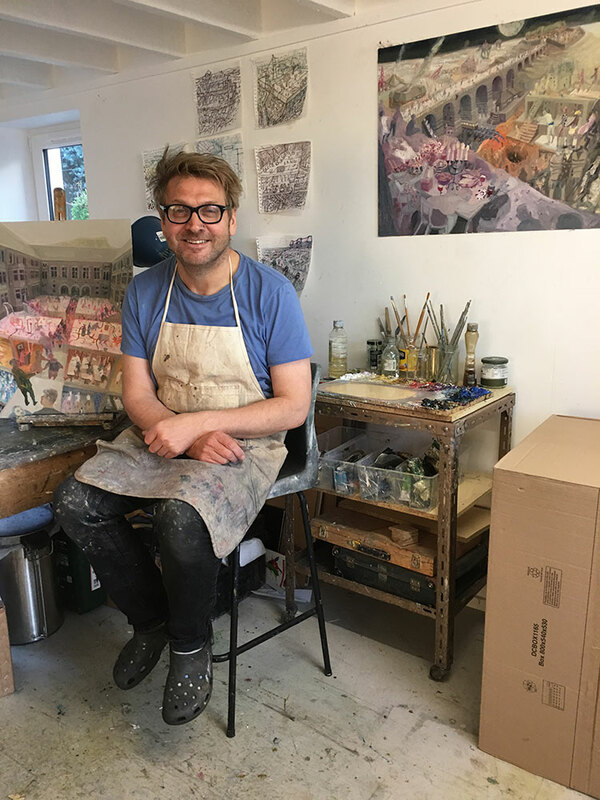 Born in Liverpool in 1964, I grew up in Aberdeenshire, before graduating in Painting at Edinburgh College of Art in 1990 and have successfully combined a career as both an artist and art lecturer. I taught painting at Grays School of Art in Aberdeen, was Head of Fine Art at University of Chichester, and also lectured at Kent Institute of Art and Design and Oxford Brookes University. I moved back to Scotland in 2007 to become the coordinator of short courses at Edinburgh College of Art, now part of the University of Edinburgh. I was also President of Visual Arts Scotland from 2013-2016. Robbie Bushe is represented by the Open Eye Gallery in Edinburgh. The thing that motivates me to draw and paint is a desire to make pictures rather than art. As a child I always drew cartoons and as a teenager I became very interested in comic strips and graphic novels. But I was never very interested in writing my own stories or illustrating someone else’s. What I did like was the form of the storyboard. I like the idea that in any frame we are seeing the results of the previous set of frames and the anticipation of what will follow in the next. I use characters that appear to come from stories in my pictures but they usually only exist in a particular work. I certainly don’t create whole histories or conclusions to their lives, nor would I have a situation clearly defined from the outset. I enjoy inventing characters, involving myself in fake mythology and tackle the technical challenges that spring up. I certainly prefer to be surprised by what I have done. I hope to trigger different stories depending on people’s own set of associations and experiences. However, most of all want people to like it as a picture. My work is a marriage of daydreams, observation and reconstruction. As a child I would build, demolish and rebuild miniature road networks in the garden based on the routes observed in my 40-mile round trip to school. Now these childhood activities have re-emerged as a crucial research methodology for my work. 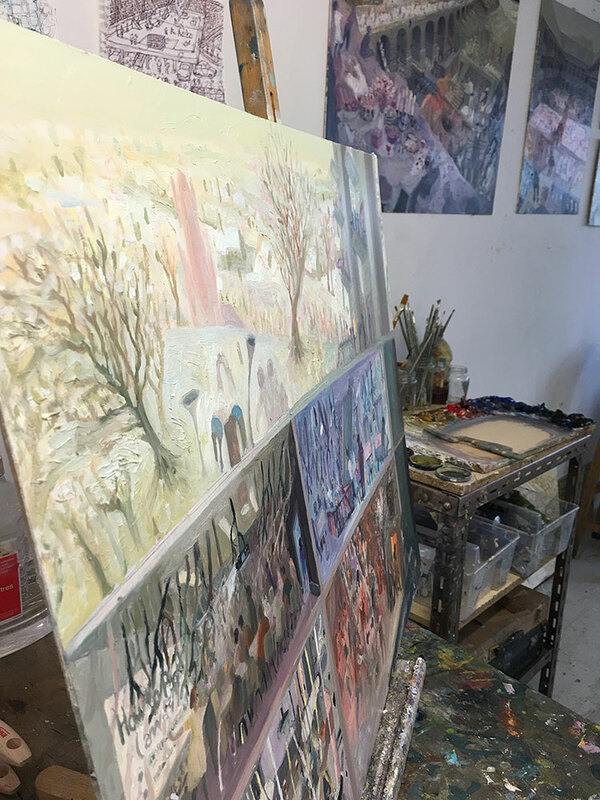 My current practices take as their starting point sprawling suburban estates and cities built on monumental panoramas – both improvised and real. My drawings follow the same thought processes as I did as a child creating elaborate environments to add buildings, people, narratives and the occasional 1970s TV science fiction reference.